3D Systems aims to make fabication machines like this one a common household object. Click here to see it in action. NEW YORK (CNNMoney) -- Imagine being able to print your own shoes or keys. Some top engineers are betting that home fabrication machines could soon be as common in the household as toaster ovens. 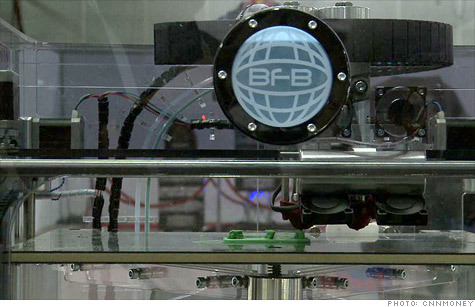 They sound cutting-edge, but 3-D printers have been around for more than 20 years. Until recently, they've been multimillion-dollar machines used mainly by manufacturers like automobile and aerospace companies. Now, the technology has evolved far enough that cheap devices are making 3-D printing accessible to the masses, spurring all types of creativity. Hobbyists are printing their own action figures, doctors have used the systems to print artificial organs, and chefs are testing out ways to print gourmet meals. Rajeev Kulkarni, vice president of global engineering at 3D Systems, estimates that the cheapest printers five years ago ranged from $25,000 to $50,000. Now, they're available for as little as $1,000. 3D Systems (DDD), a Rock Hill, S.C.-based pioneer in industrial 3-D printing manufacturing, wants to position itself at the forefront of what it calls the "democratization" of 3-D printers. "We've been doing 3-D printing for 25 years," Kulkarni says. "We've had production systems and large systems for a long time. This is our attempt now to get at the consumer level, where we make 3-D printing accessible to the mass market." The company recently partnered with software makers Autodesk (ADSK) and Alibre on all-in-one printing kits. Starting at $1,500 for the Alibre-powered RapMan model -- one that requires assembly -- they're not exactly cheap, but neither were the first clunky generation of home PCs. Kulkarni thinks this is just the dawn of the field. Wohlers Associates, an independent consulting firm that has tracked the evolution of 3D printers, agrees. It expects the industry to grow from $1.3 billion in 2010 to $5.2 billion in 2020. Georgia Tech research scientist Grant Schindler is already building tools for the wave of home 3-D hobbyists he sees emerging. He recently released an iPhone app that allows users to scan and print models of their faces on home fabrication machines. He thinks 3-D printers will really take off when average people find the right use for them. "It's more like 10 years before it comes really common," he said. "And there has to be a killer app -- maybe jewelry is it. There needs to be something that everyone wants, that everyone says 'I need this 3-D printer.'"